the life of a limb: Our new addition! Well the time came that we had to put our dog Katy down. We had her for about 16 years and she had gotten very sick. She had a hard time moving anymore and it was time to put her out of her pain. This was especially such a hard time for my mom and Austin and we decided we needed a pet in our home. So my mom brought home a cute kitty one day. We decided to let Austin name him and he chose Bazel from Baker Street. He has been loving to watch The Great Mouse Detective lately and Bazel is a mouse on the show. Also, Austin and I love sharing our nights together! 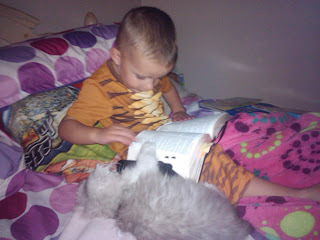 We like to say our prayers which Austin calls his bless and read a little from the scriptures. I thought this picture of Austin and Bazel was so cute! I love what a sweet spirit he is getting!